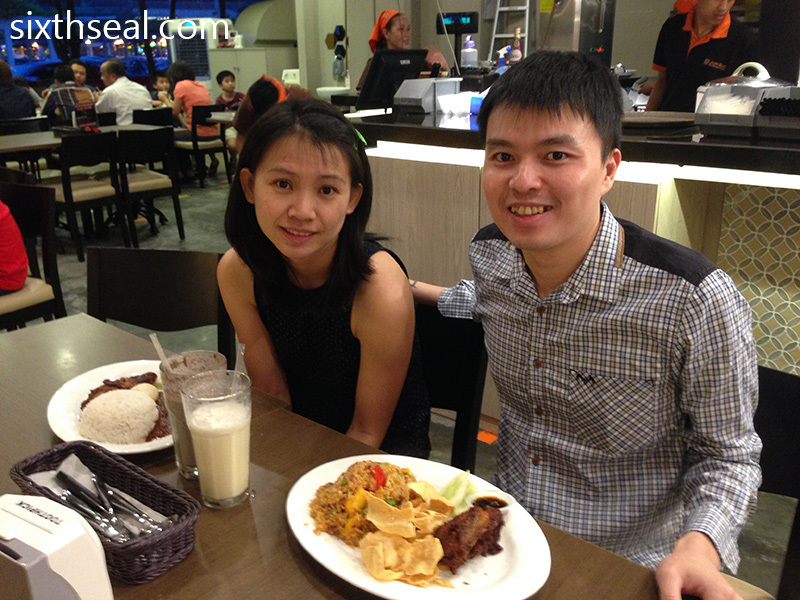 We were at Citta Mall when we came across this relatively new restaurant. 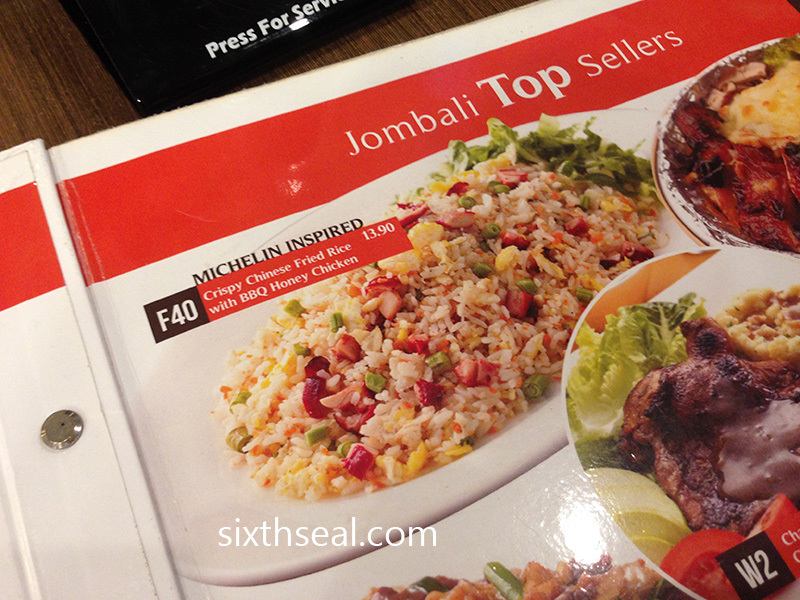 Jombali had taken out a large sign which advertised (of all things) a Michelin inspired dish. Needless to say, this had nothing to do with Michelin and I have no idea where the whole “inspired by Michelin” bit came in. 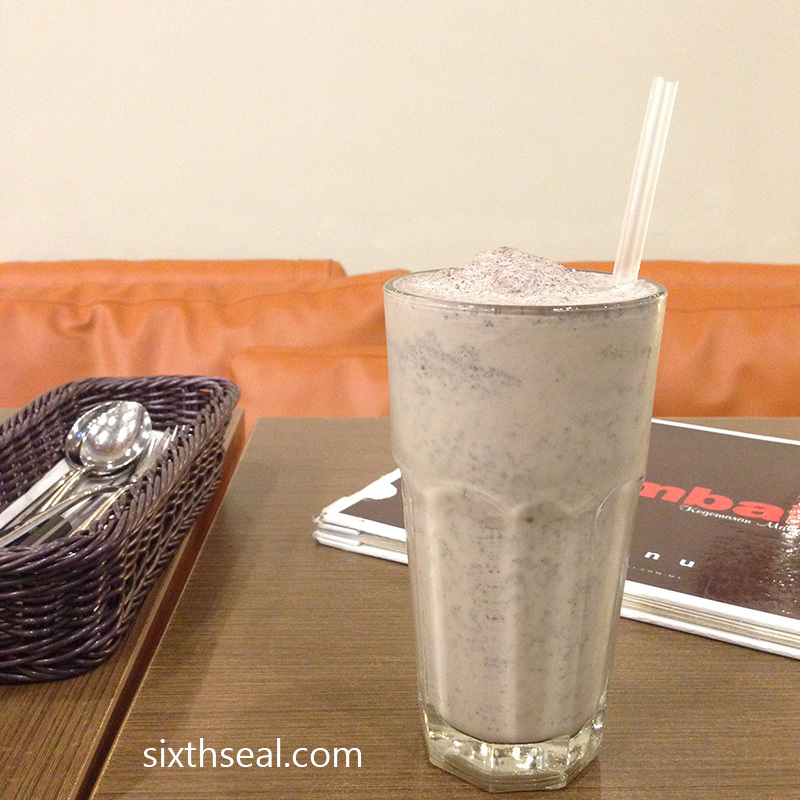 I ordered an Oreo Shake (RM 8.90) and my better half had a Coconut Shake (RM 8.90). The latter was quite enjoyable, tasted a bit like the Thai counterpart it was meant to emulate but the former wasn’t anything to write home about. 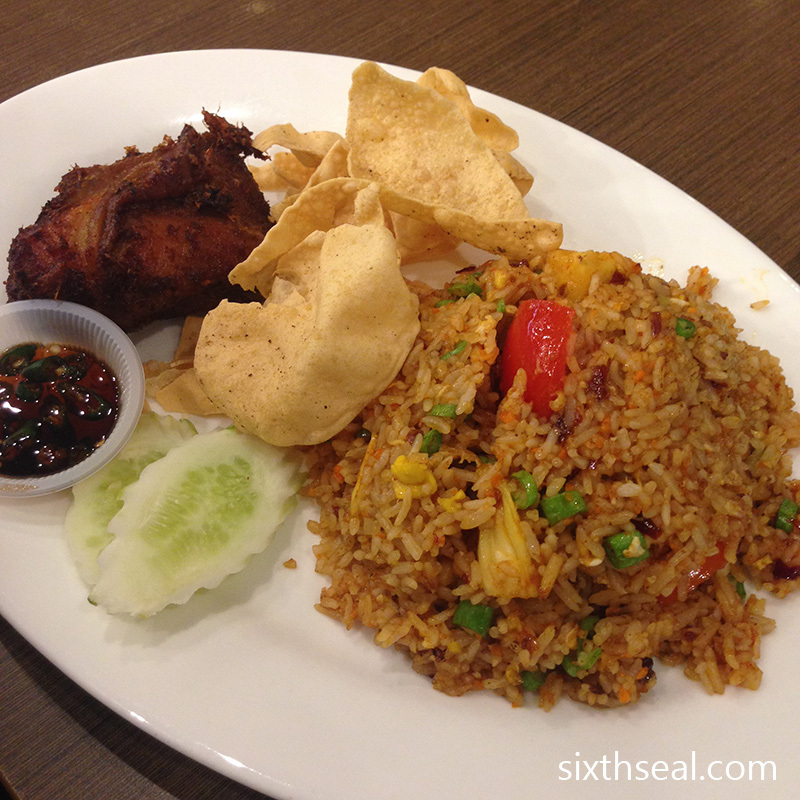 It was dinnertime so I had the Nasi Goreng 3 Rasa with Ayam Goreng (RM 13.90). This was from their Jomabli Top Sellers menu and the 3 Rasa part means “3 tastes”. It pulled that off quite well – the fried rice was salty, sour (from the tomatoes) and spicy. The portion was GIGANTIC though and I couldn’t finish it although it was good. 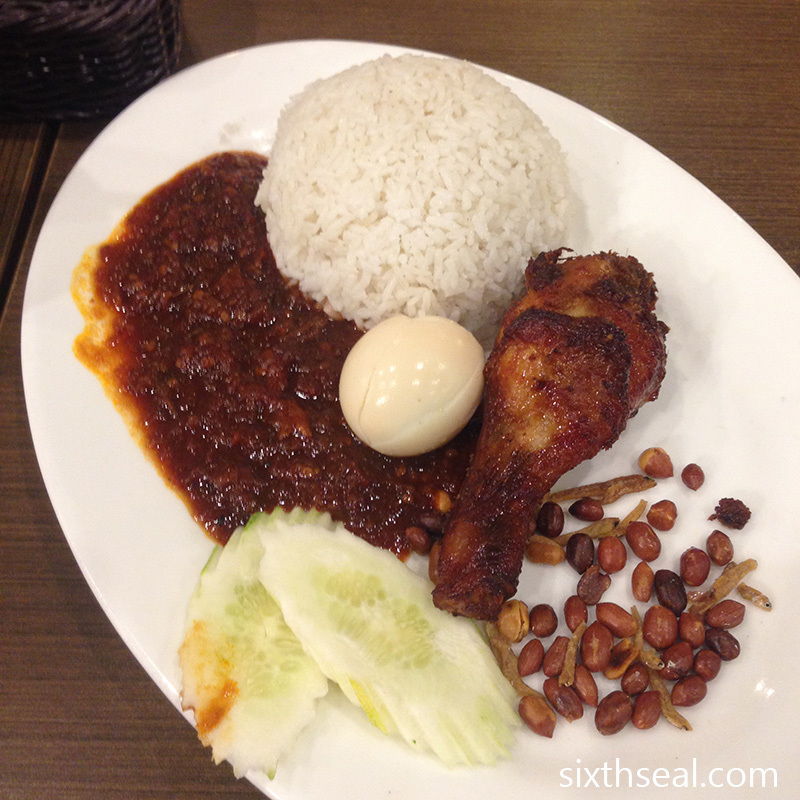 My dear had the Nasi Lemak Ayam Goreng Berempah (RM 10.90) – the chicken is the same but hers is made with rice steamed with santan (coconut milk). It also came in a Supersized portion but the rice wasn’t very hot. I think part of it was due to them trying to serve us both at the same time, a very noble concept but maybe not so suitable for an eatery of their aspirations. 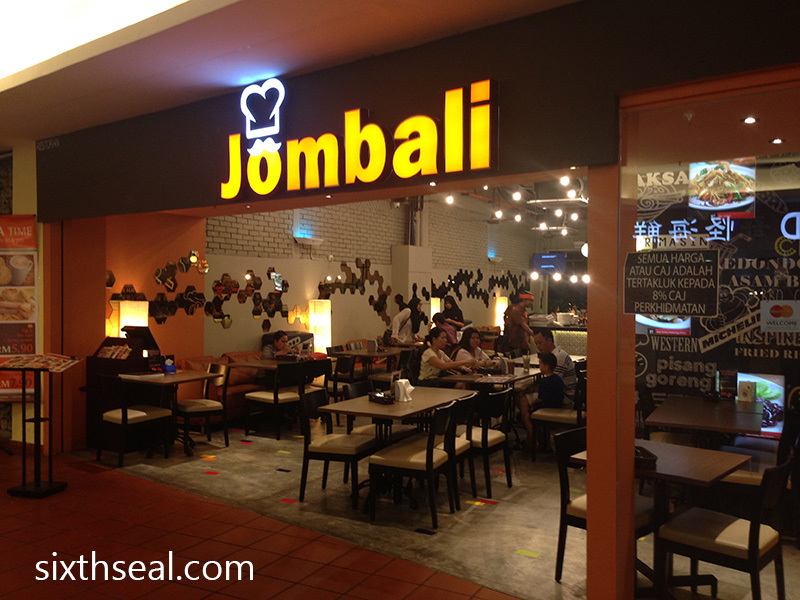 Jombali serves up decently priced food and adds to the selection at Citta Mall but we probably won’t be going back again unless we were really hungry. 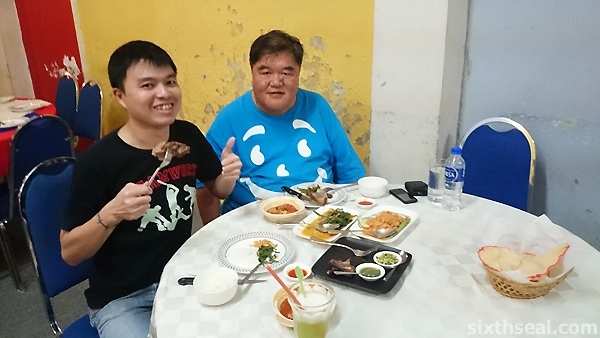 My better half came back with me to visit my dad during the weekend and since it was just a 24 hour trip, we only had *one* dinner and this is the place we chose to go to – Payung Cafe! I was one of the first people to visit when they started six years ago (we were even asked to name the first iterations of the desserts which are refined staples now) and I make it a point to visit when I’m back in my hometown. 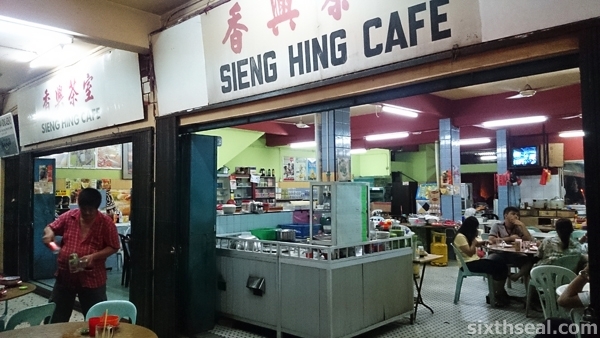 Payung Cafe opened in 2008 and it was very unknown back then since they only had dinner service and the place was shuttered during the day with no signboards. It didn’t help that it looked like the reception area for a marine survey company either. 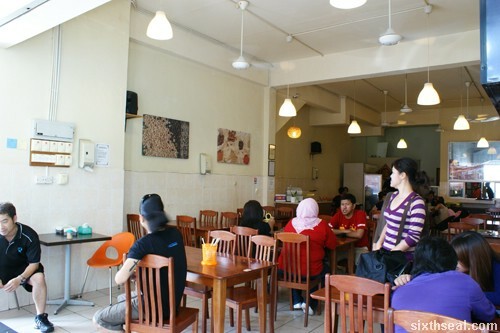 However, the same Joyce who gave us the number of Glory Cafe in Sarikei is also very active in a Chinese language local forum and a bunch of us paid this newly opened place she heard about a visit. The food here is unique and the service is great. 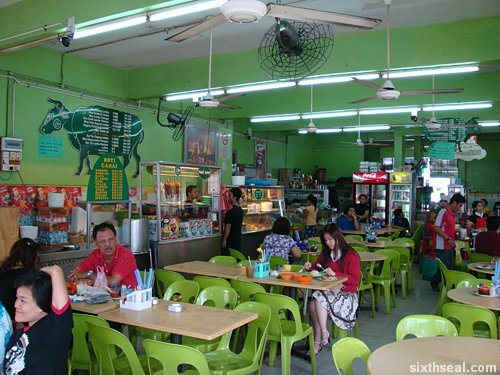 That’s what makes Payung Cafe a favorite among certain locals and visitors alike despite the relatively higher prices it charges on average. 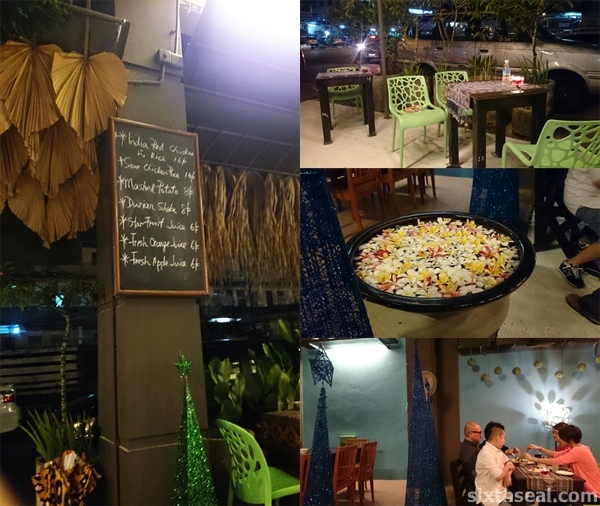 The Christmas decorations are up when we went – we opted to go to the original al fresco outlet instead of the new Payung Mahkota (which is located in the lobby of a hotel). I feel the former has a much better ambiance since the latter can be a little antiseptic due to it’s location. 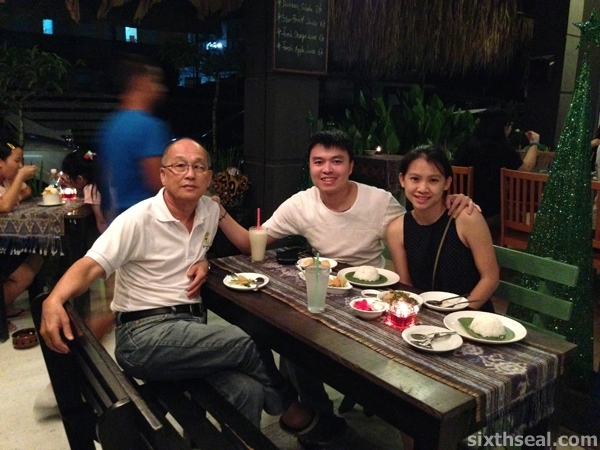 For starters, we all shared a Pomelo Salad (RM 8). 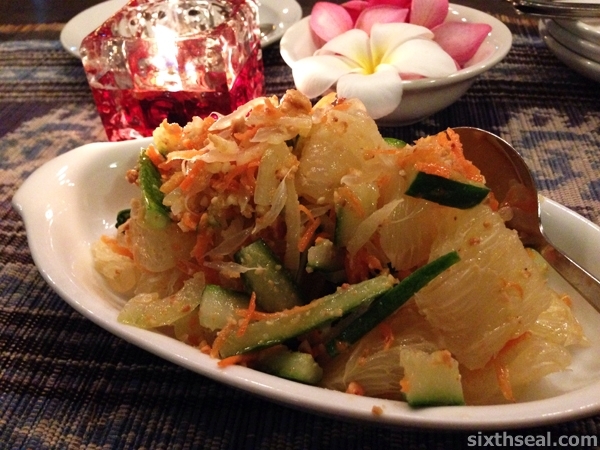 I love the choice, the pomelo comes in large chunks and the dressing is restrained, making it a fresh and vibrant dish. My late maternal grandma used to have a pomelo tree and I remember this fruit as being bitter but like Brussels sprouts, it seems to have been genetically modified to be less bitter nowadays! It’s sweet and juicy and we all were ready to dig into our main courses after popping a couple of the large chunks of fruit. The special of the day is Sour Chicken (RM 16). It’s not on the regular menu, this is written on the chalkboard that lists what’s fresh and cooking on that very day and I like to order from here since I’ve tried most of their menu items. This is something I’ve never had before and all of us loved it! The chicken is moist and tastes appetizingly sourish. 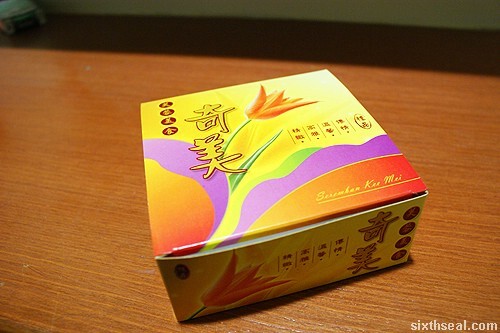 I asked how it was made since we were all trying to guess what the sour element is and was told it’s a mixture of laksa leaves (Vietnamese coriander/Persicaria odorata/daun kesum) and coriander seeds (which provides the sour citrus tang). 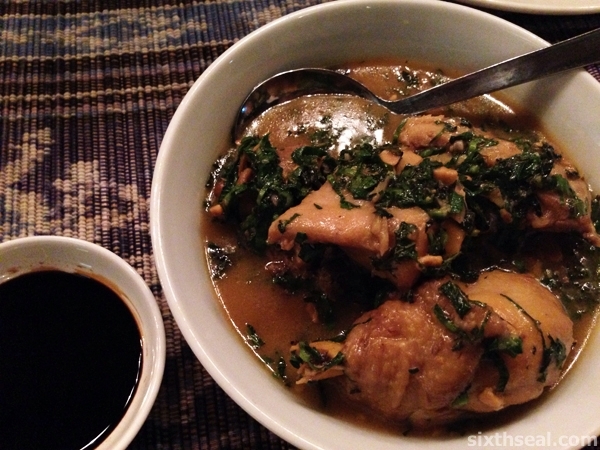 I highly recommend this dish – it’s delicious! 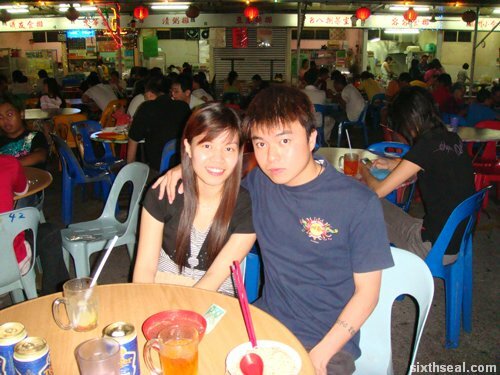 I also ordered Kacama Chicken (RM 16) for my dear. 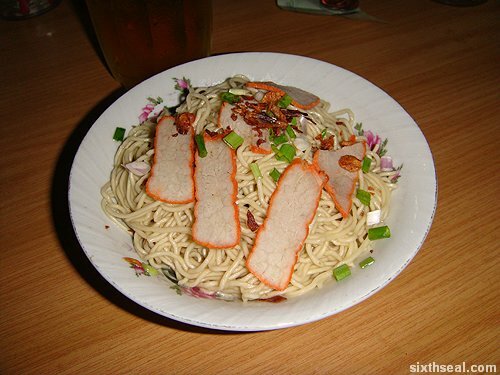 I wanted her to try this uniquely Sarawakian dish while she was here. 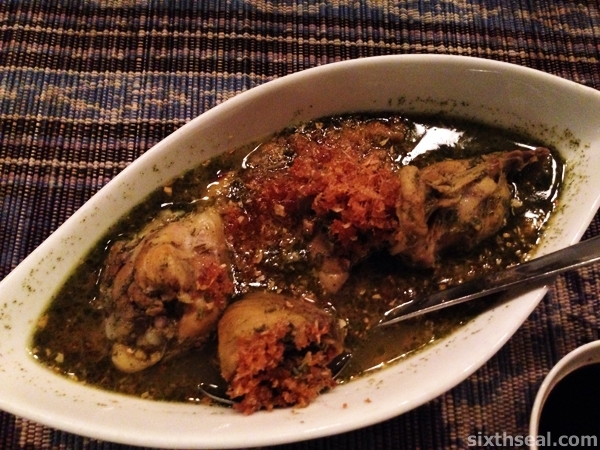 Kacangma chicken is made from a herb the Hakka people call yi mu cao (益母草) or motherwort. The taste is like nothing else, it’s traditionally used as a “confinement dish” and the liberal use of pounded motherwort makes this dish taste bitter and earthy. Of course, the Otak-otak Fish (RM 13) is always a must-order when you’re there. 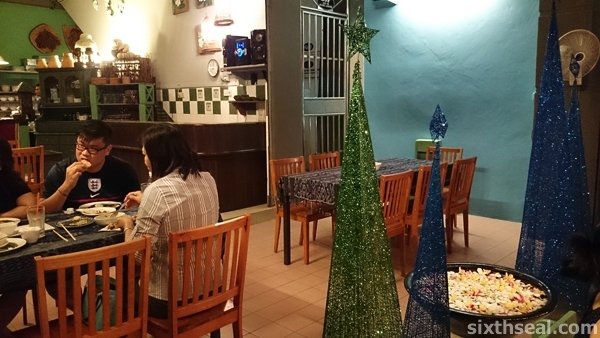 The price has more than doubled since 2008 but if Payung Cafe had a flagship or signature dish, this would be it. They actually make it in-house every day! 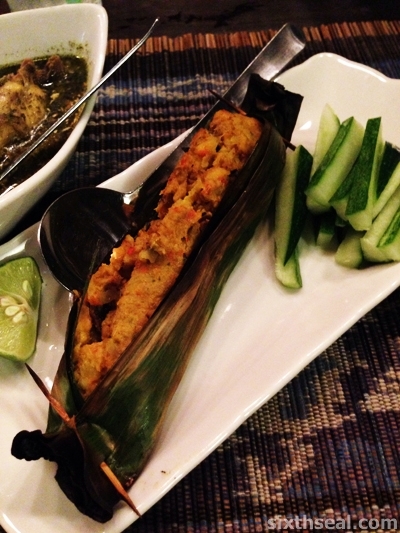 The ground fish meat with tapioca is wrapped inside a banana leaf and baked to perfection. The otak-otak is served bursting from the seams and the generous use of chilli and tumeric makes this a dish not for the faint-hearted. It’s very spicy but if you can take the heat, you’ll love it. 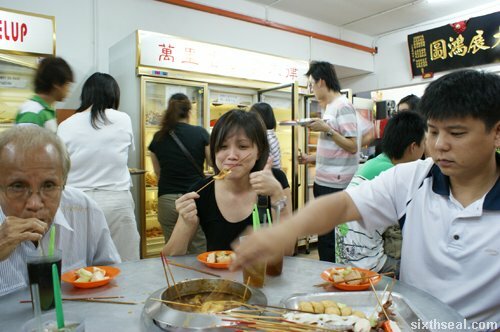 It’s very different from the steamed otak-otak from Johor or grilled otak-otak we get in Malacca. They really make one of the best versions around. 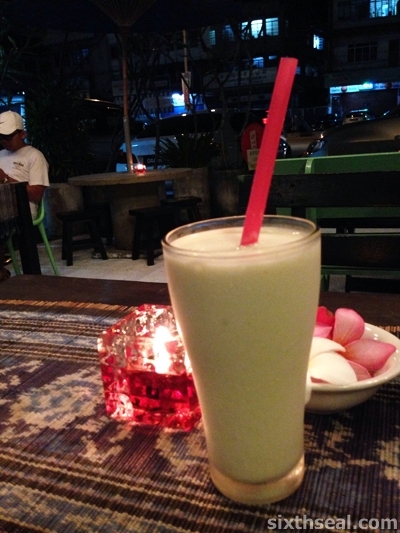 My better half also had the Durian Shake (RM 8) – a very thick concoction sure to please all durian lovers and connoisseurs of milkshakes. 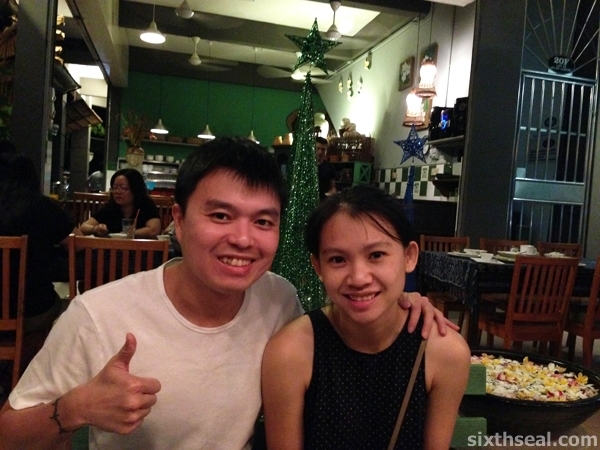 The bill came up to RM 82 for the three of us, which is quite reasonable for dinner at Payung Cafe. 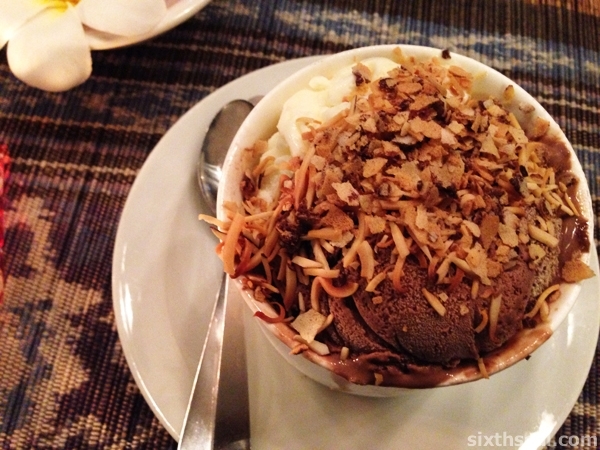 We made room for dessert and shared a Sambarina Ice Cream (RM 8) which is made in a yin-yang fashion with large scoops of chocolate and creamy vanilla ice cream stuffed into a jumbo sized ramekin and topped with a mixture of crushed nuts and other crunchy bits. I approve! 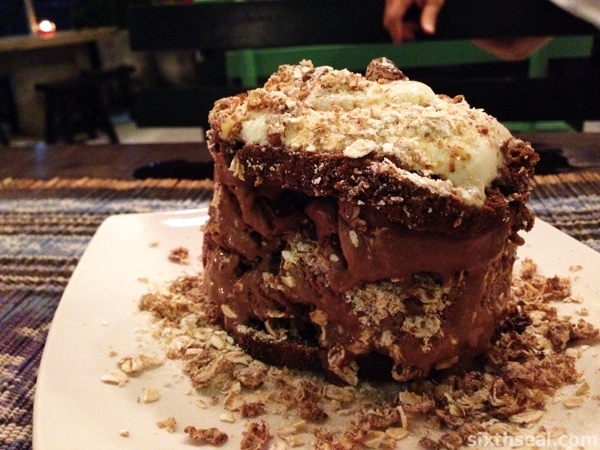 My dear loved the Mulu Ice Cream (RM 10) – a beautiful creation of huge slabs of their own ice cream layered and sandwiched with cake and cream and sprinkled with muesli. It’s a gorgeous and deliciously messy end to a wonderful dinner together. 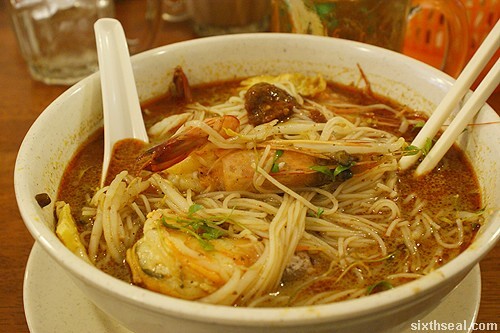 Satay Celup originated in Melaka but like most other things it has migrated far and wide. I hear it’s even available at the mobile lok-lok trucks around here, but for the Real Deal (TM), nothing beats going to Melaka to eat satay celup! 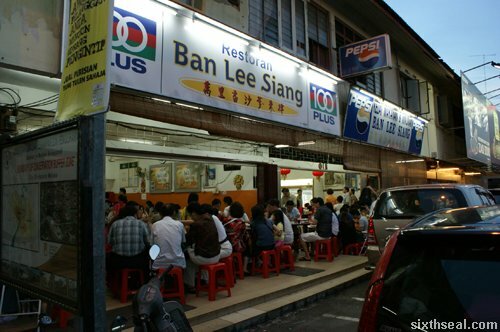 The place we went to is none other than Ban Lee Siang – one of the renowned satay celup establishments in Melaka. 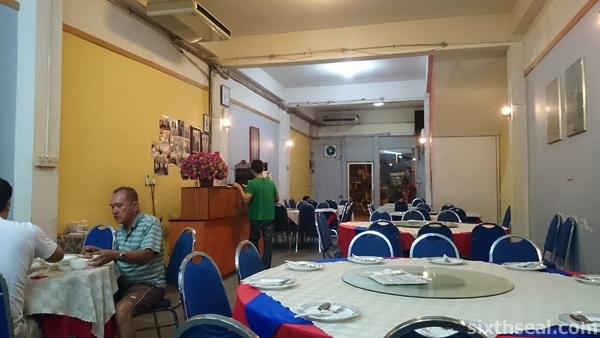 There are two other satay celup places flanking Ban Lee Siang and it’s very telling that Ban Lee Siang is the only one packed to the rafters, with people waiting for a free table while the other two are practically deserted. 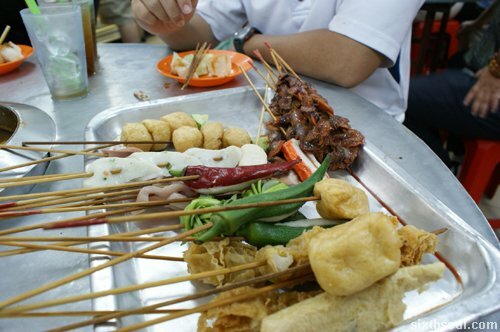 Satay celup is a Malay word meaning “sticks of stuff” and “dip”. 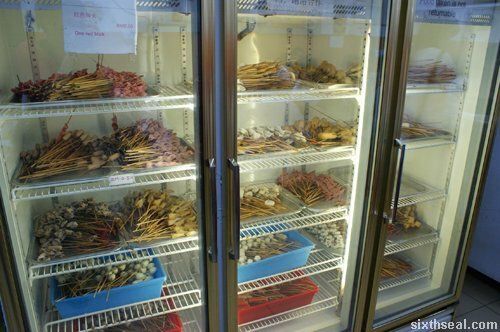 The skewers are kept refrigerated and you walk around with a tray to choose the items you want. There’s easily 50 different items on offer, ranging from clams to quail eggs and everything in between. 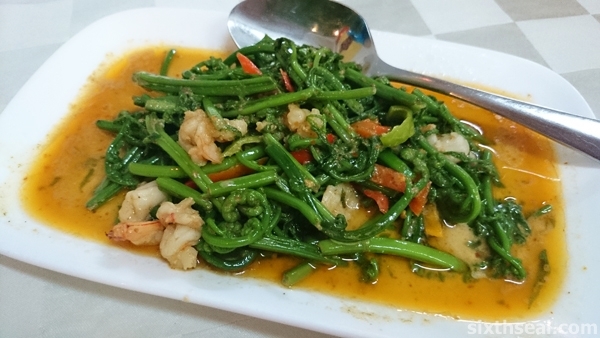 The prawns are surprisingly fresh and sweet, and the balled up vegetables provides a nice, crunchy texture. The mushrooms and stuffed chillis are pretty good too. 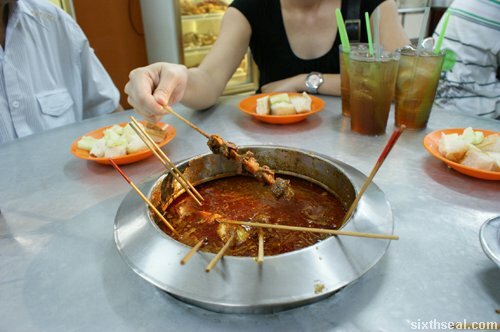 Satay celup invariably comes with the same setup – there is a communal satay celup pot in a recessed pit in the middle of the table. 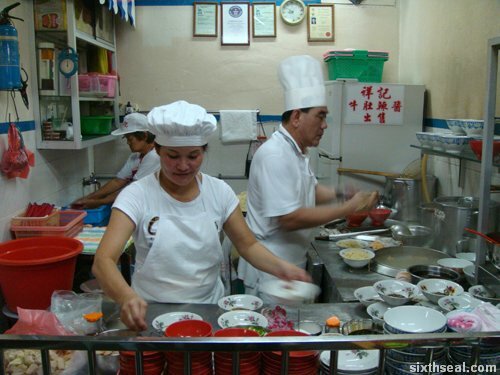 The satay celup pot is constantly kept full by the staff, who roams from table to table to refill the sauce. 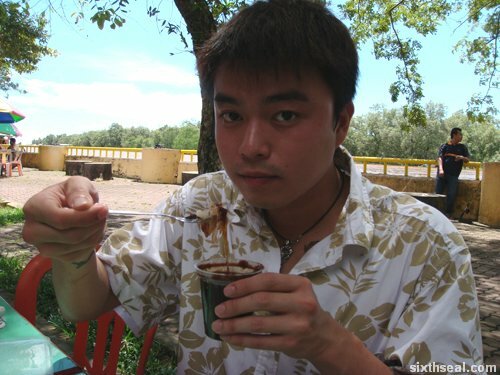 The sauce is none other than satay sauce a.k.a. peanut sauce! 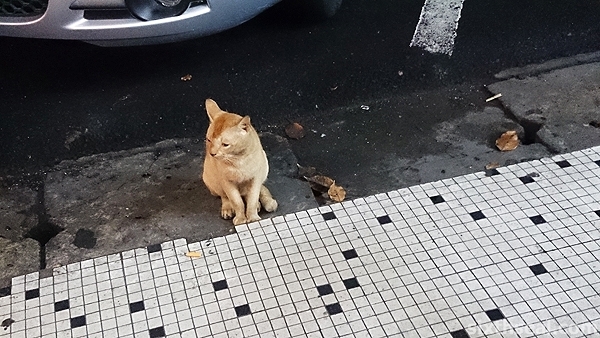 This is what makes satay celup interesting. It’s like lok-lok (where you dunk food skewers into boiling hot water or broth) except you dip this into a simmering pot of peanut sauce. 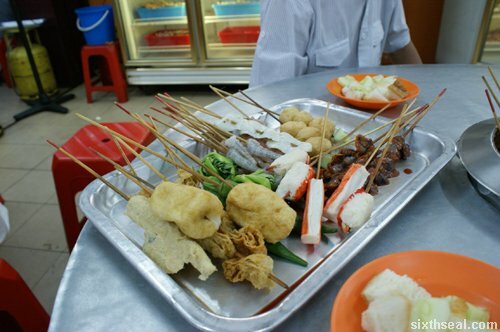 The sweet (albeit diluted) satay sauce tastes delicious with the meat, vegetables and seafood on sticks. It’s a great twist to a classic dish. 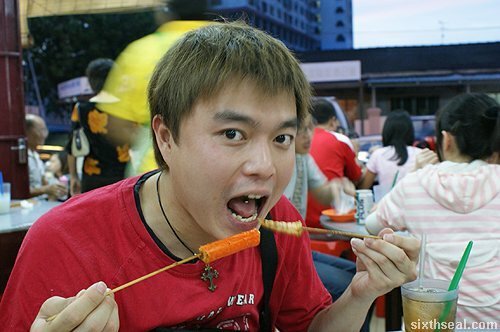 The satay celup system, for the uninitiated, is rather like a buffet. You pick the items you want from the bank of fridges and put it on a tray. Each stick is RM 0.50 except the red color coded ones, which goes for RM 0.60. You’re free to eat as much as you want and by the end of the meal, a waiter comes over to count the number of sticks you’ve consumed and you pay accordingly. Easy! 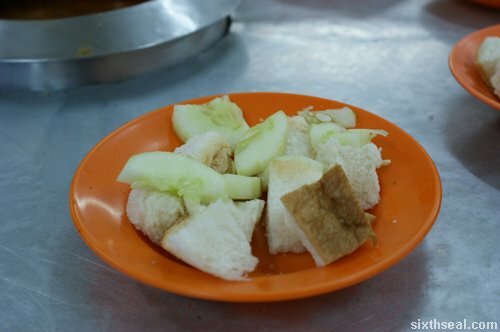 Satay celup in Melaka is served with bread. 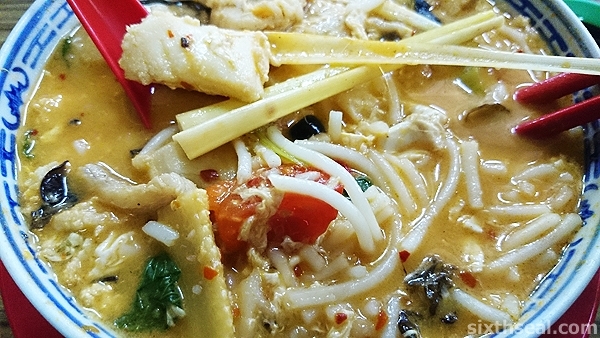 The bread is used to soak up the delicious peanut sauce. I think the peanut sauce actually tastes better after a lot of people have eaten from the same communal pot. 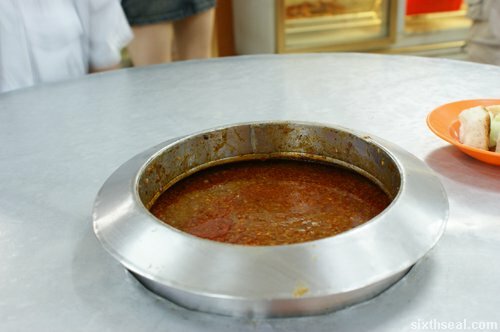 The satay sauce absorbs the taste of the ingredients dumped into it by previous diners since the pot is never emptied but refilled. 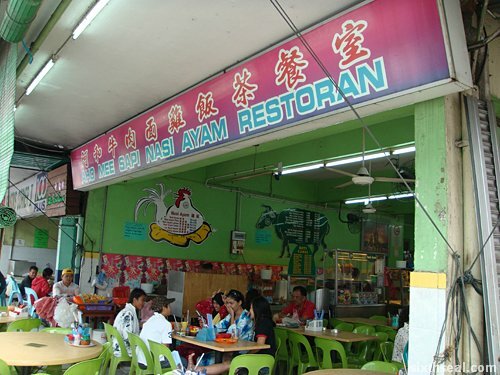 Aho Mee Sapi Nasi Ayam Restauran (Literally: Aho Beef Noodles Chicken Rice Restaurant) is one of the best places in town to have beef noodles. 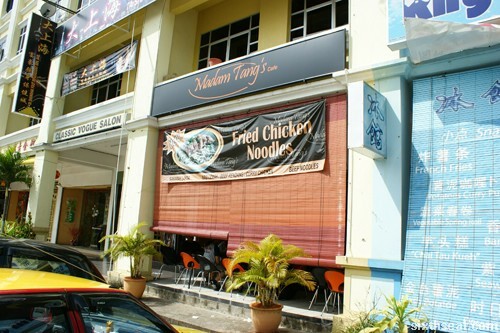 It’s a halal establishment operated by Malays and as the signboard suggests the two flagship dishes are the beef noodles and the chicken rice. The place tends to be a bit packed during lunchtime and parking can be a bit of a problem. I went with Autumn, who doesn’t eat beef (or pork for that matter). 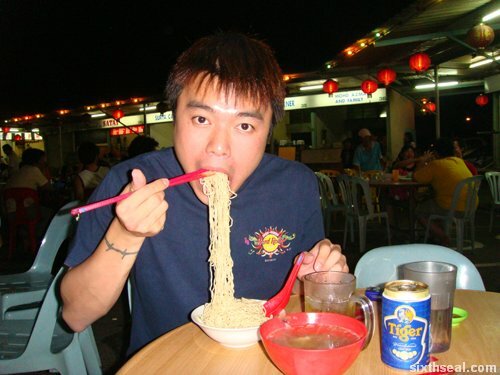 I’m not a big fan of chicken rice but I love beef noodles. 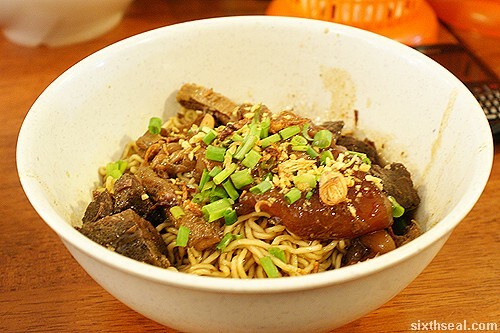 Aho does a very good version of beef noodles, Malay style. 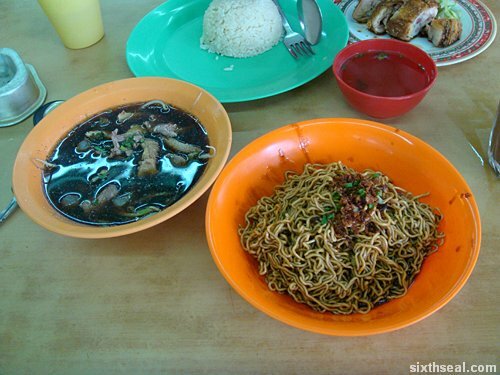 I just love the chicken shaped menu for chicken rice and the cow shaped version for beef noodles. Heh! 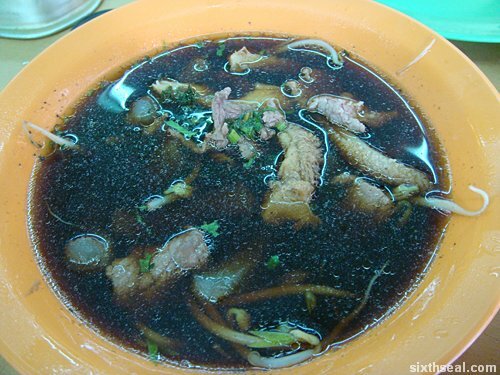 I had the mixed beef noodles (RM 4) which can be ordered with the noodles in a separate bowl (dry) or mixed into the soup (wet). Soupy dishes during lunch isn’t really my thing, not just coz of potential Splash Damage (TM), but coz it increases the body temperature at the warmest time of the day. 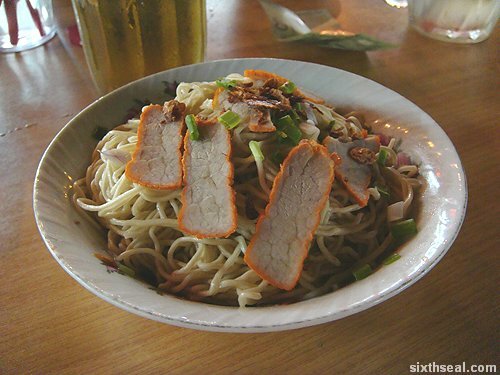 Thus, I ordered the dry version with the noodles on the side. 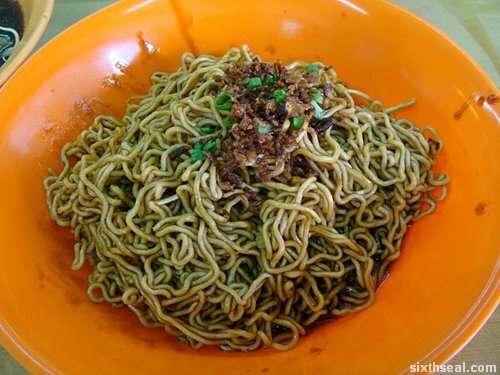 The noodles are mixed with Essence of Cow (TM) – it’s so full of mooing goodness, you can taste the beef in the noodles. It’s delicious! 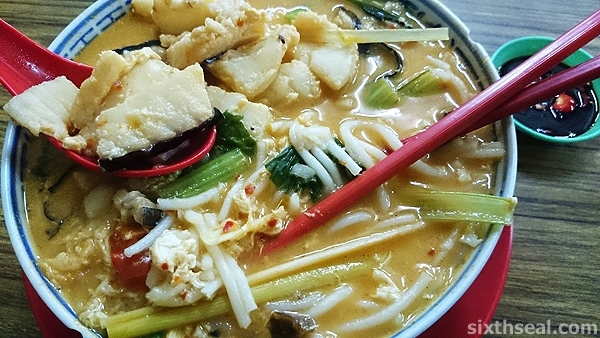 The soup is even better – you can opt to have certain parts of the cattle or a mixed bowl, which has everything except the genitalia (that part is reserved to make Sup Power). Aho does a very good beef noodle soup. It’s hearty and has that elusive umami taste to it. 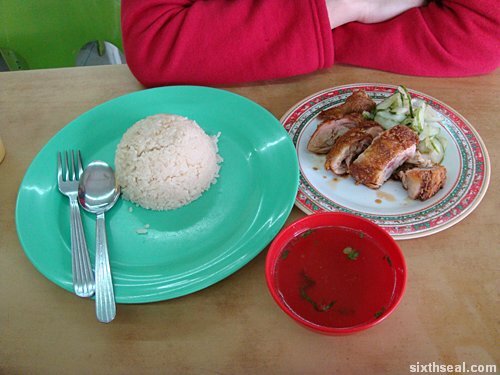 Autumn had the other specialty of the house – fried chicken rice (RM 4). 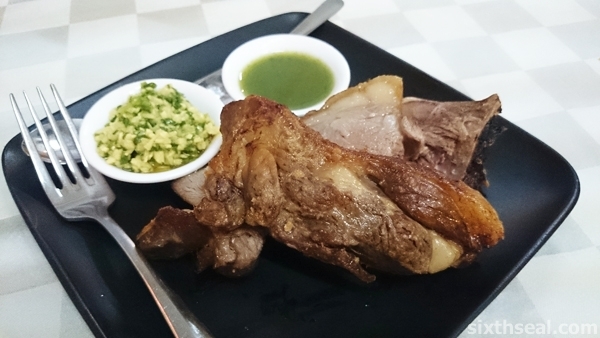 Aho serves fried chicken instead of the usual steamed or roasted chicken. 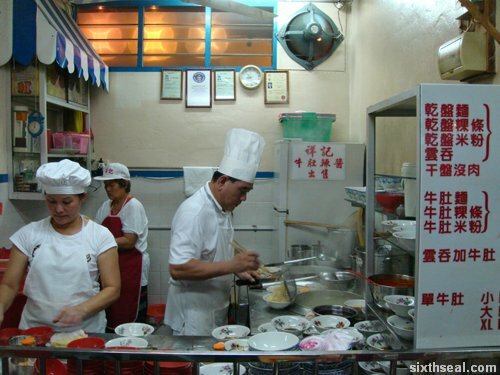 However, they do a very good version of fried chicken – it’s not over fried, so the skin comes out crispy but the inner parts are still tender and juicy. 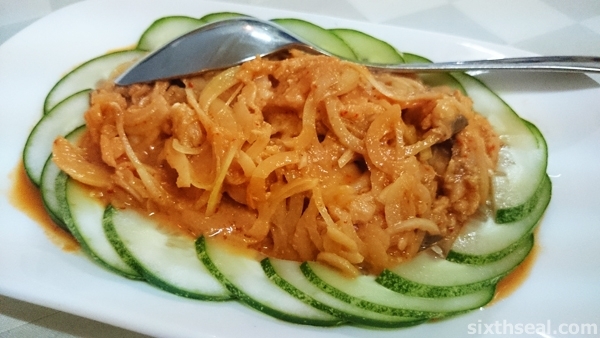 Umai is a raw fish dish prepared by the Melanau tribe in Mukah. 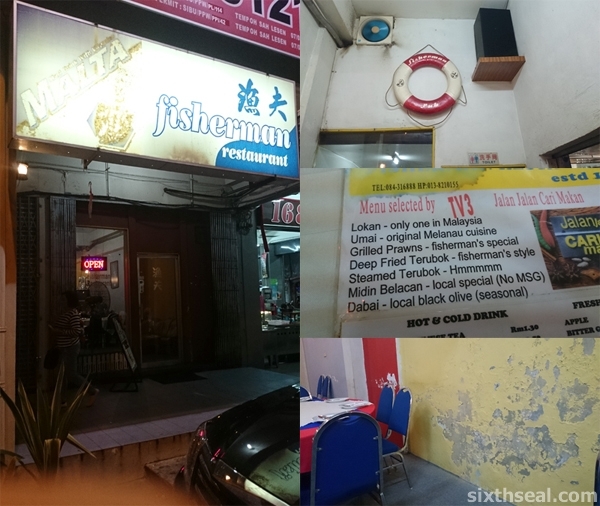 It’s a must try dish if you ever go to Mukah. 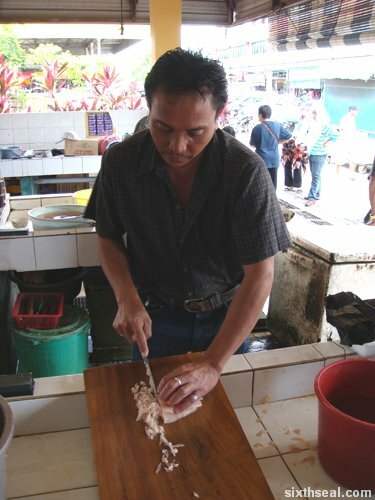 It’s the Malaysian version of the sashimi and is traditionally the working lunch for Melanau fishermen. 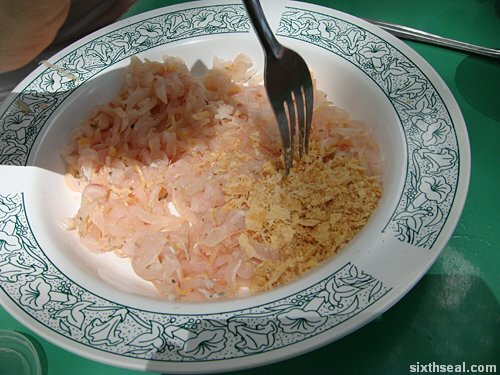 Umai is made of thinly sliced slivers of raw fish and served with toasted sago pearls. 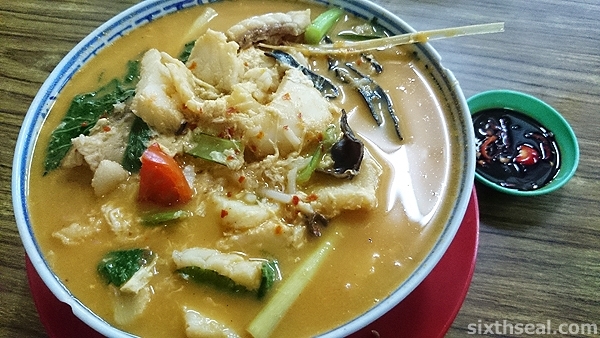 The popularity of the dish for the fishermen is pragmatic – it doesn’t need to be cooked while deep sea fishing and the sago pearls provides the carbohydrates for a filling lunch. The fish has to be really fresh for umai to be prepared since it’s eaten raw. I tried my hand at slicing the raw fish and gave myself a nasty cut to the index finger. 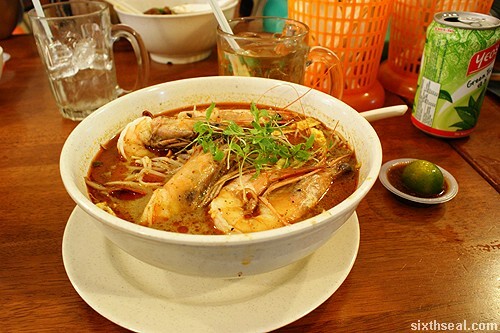 Umai is readily available in the markets of Mukah and it’s one of the flagship dishes that Mukah is known for (besides sago grubs). 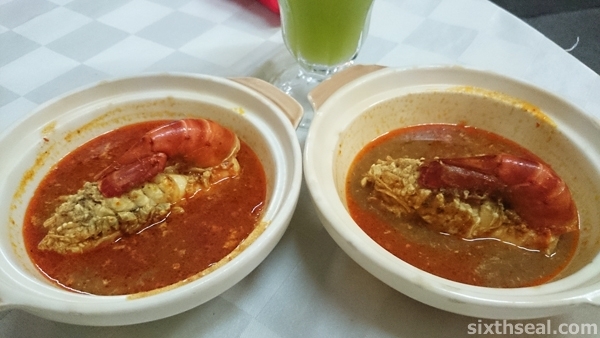 There are two different versions of umai – the traditional umai sambal campur and umai cecah jeb. 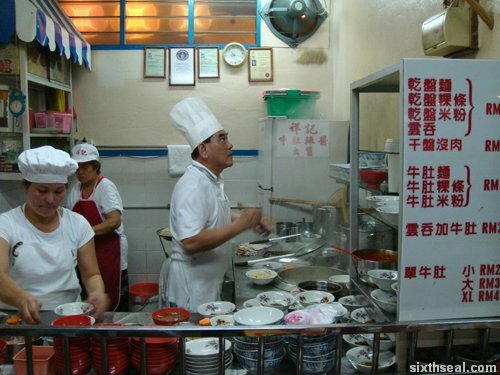 Step 1: Ensure that a reputable umai stall is patronized. The fish needs to be really fresh for raw consumption to avoid uncomfortable conditions like E.Coli and explosive diarrhea. Step 2: Find a comfortable place to mix your own umai. 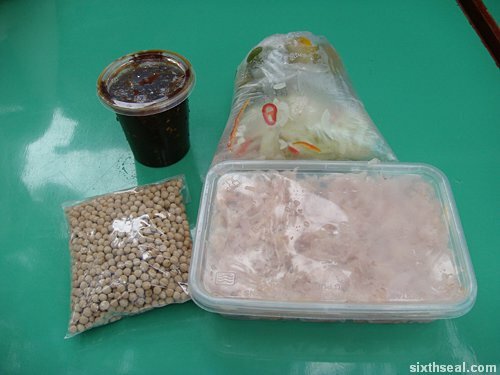 The ingredients for making umai can all be purchased at the stall and most of the stuff is prepackaged and premixed to the right amounts. 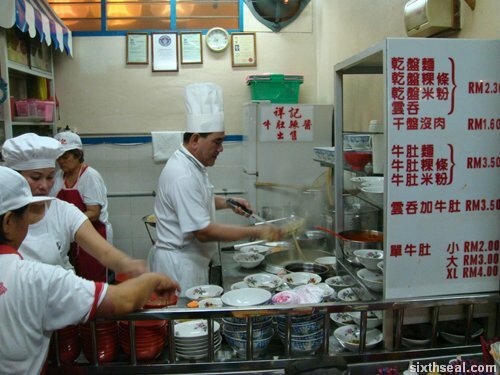 Step 3: Receptacles for the mixing of umai is essential. You would require a plate and a bowl in addition to forks. 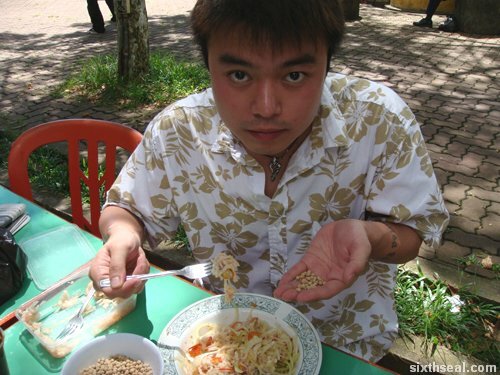 Sago pearls are eaten using your hand. 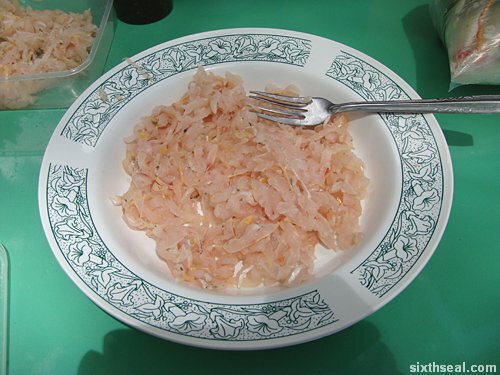 Empty the raw slivers of fish into the plate. 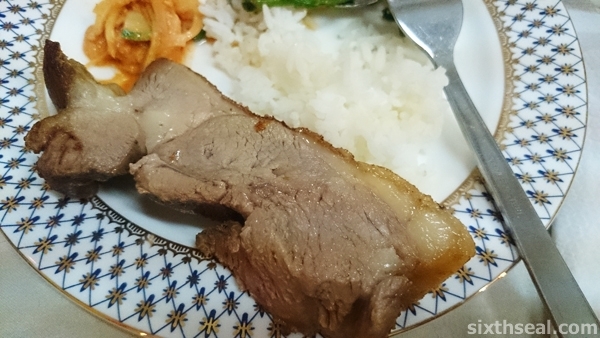 You can opt to retain a small portion of the raw fish for the the other version of umai. 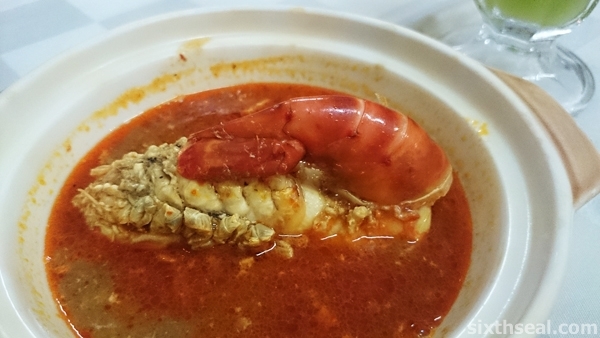 Step 4: Inspect the contents of your umai sambal campur package. 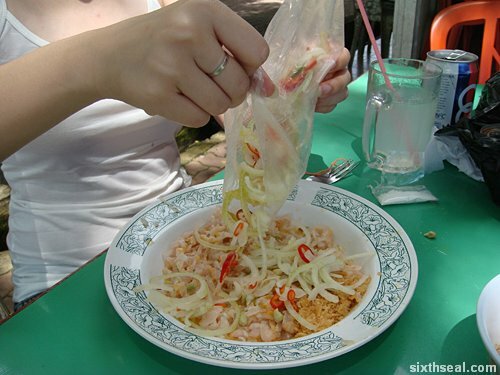 It should contain a bag of premixed ingredients essential to the umai experience containing raw onions and chillies. Calamansi limes should also be in the package for the original umai as well as a small packet of salt and the crunchy peanut cookies. 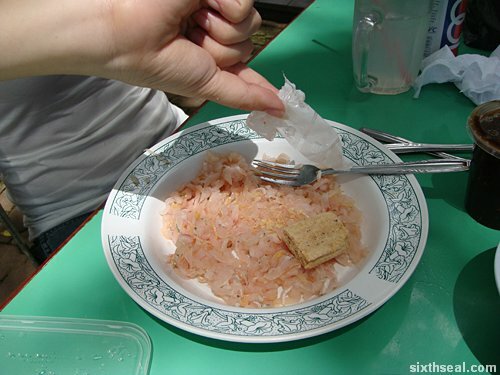 Step 5: Open the packet of crumbly peanut cookies and put it on top of the raw fish slivers. This is the secret ingredient in all good umai dishes that provides the sweet and crunchy texture to the dish. Step 6: Crush the peanut cookie into a finely grounded powder using the fork. You need the peanut cake to be evenly distributed throughout the dish. 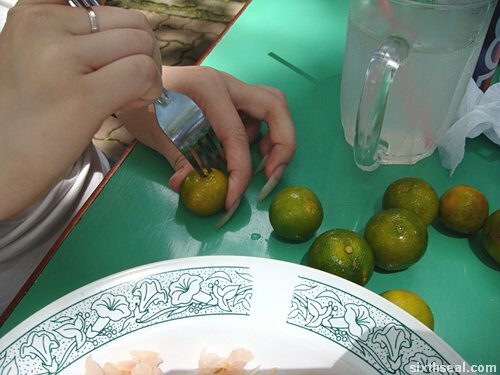 Step 7: Pierce the calamansi limes using a fork to enable a reasonable flow of the juice into the umai. Do not attempt to squeeze the lime without penetrating it with a fork (or another sharp utensil) first. Splash damage is likely to occur. 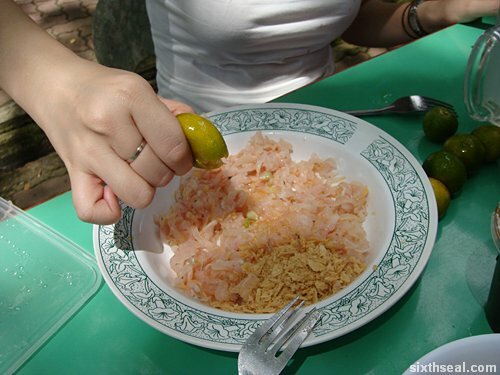 Step 8: Squeeze the calamansi lime over the raw fish. 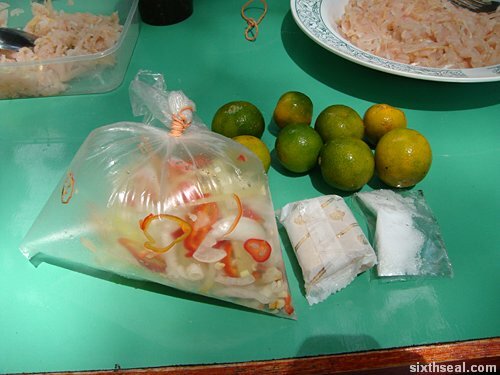 Step 9: You need all the calamansi lime juice provided since the acidic nature of the fruit “cooks” the raw fish. 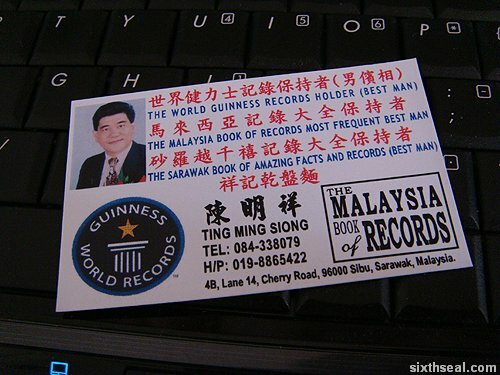 I’ll explain the scientific principles at the bottom of the guide. 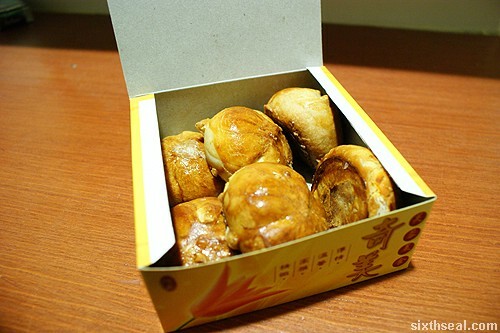 Step 10: Open the small packet of salt and empty the contents into the umai. The salt offsets the sourness of the calamansi lime and makes it sweet. 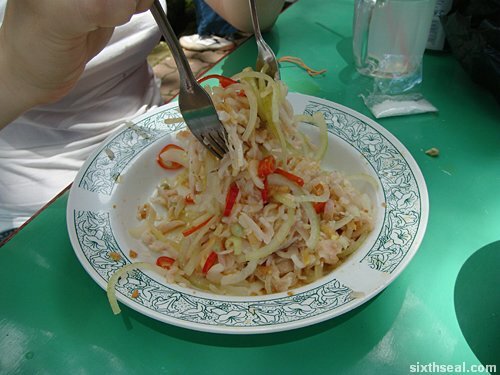 Step 11: Open the plastic bag containing the thinly sliced onions and chillies and empty it into the plate of umai. Step 12: Toss the umai with a fork as you would toss a salad. The motions are similar and so are the aims – to mix everything as evenly as possible. 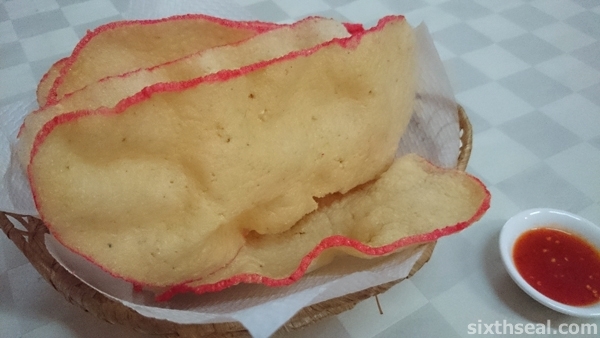 The traditional umai is now ready for consumption! 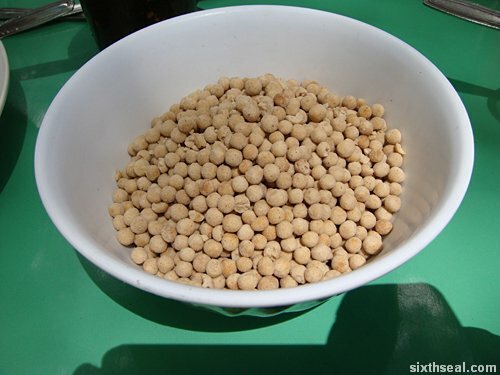 Step 13: The final step is to empty the sago pearls into a bowl for easier consumption. 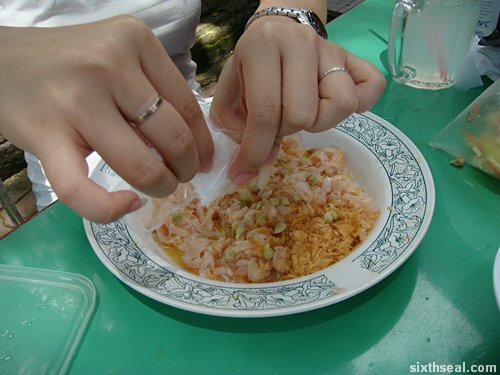 The sago pearls are eaten using your bare hands to go with the umai. 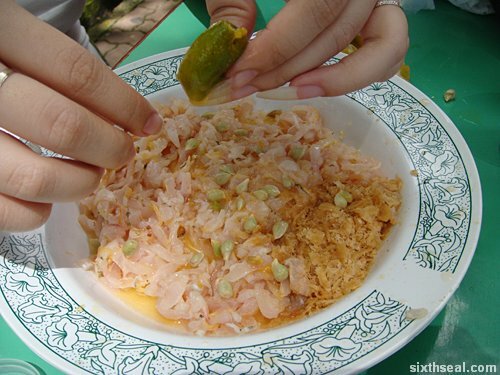 Step 14: Consume the umai with a handful of sago pearls. 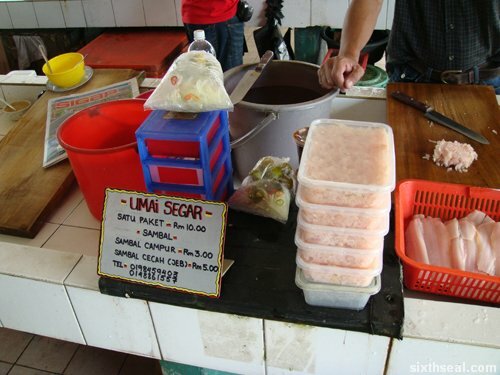 The umai should be eaten first and chased with the sago pearls for the authentic Melanau umai experience. 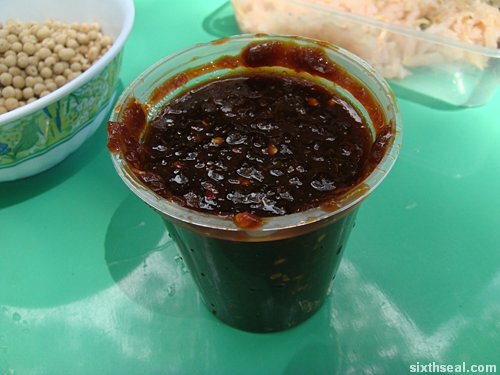 There is a new variant of umai called the umai cecah jeb which is dipped into a sambal (spicy paste) concoction. 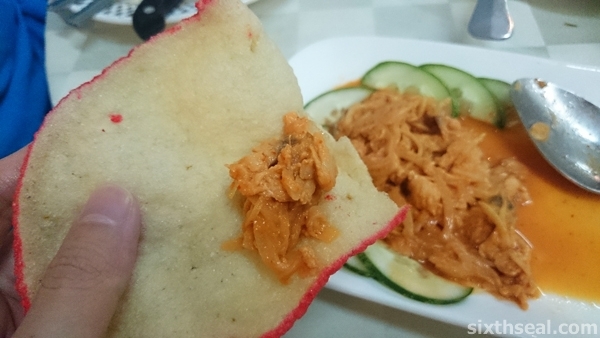 You’re supposed to take a forkful of umai (raw fish) and then dip it into the special sambal sauce and eat it. It’s delicious! The sambal really got oomph! Very spicy. I like! The calamansi lime has acidic properties that “cooks” (cures would be a better word) the raw fish in the umai due to reasons beyond my understanding. It just works. 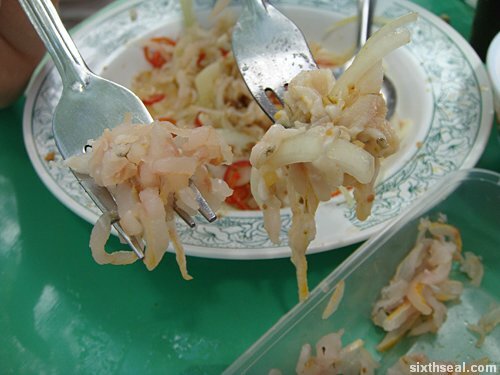 The left fork contains the raw fish before the calamansi lime treatment and the right fork contains the slightly “cooked” fish after being marinated in calamansi lime. You can see the difference in the coloration and texture of the fish.